How to enjoy Santiago after your pilgrimage, where to leave your backpack while visiting the city and where you can get medical attention if you need it. 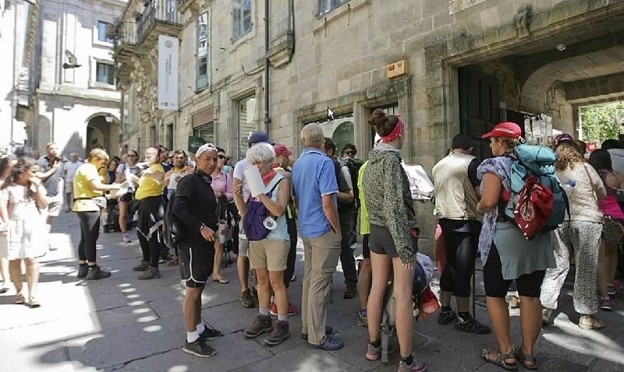 Pilgrims who want to enjoy Santiago de Compostela without been laden down have the option of storing their backpacks in safe places. The most central place offering this service is at the basin of Xoán XXIII (Avenida de Xoán XXIII, s/n | (+34) 981 576 698). In the office of the Professional Association of Tourist Guides in Galicia, here they will store luggage for one euro per day. It is open from Monday to Sunday from 09.00 to 20.00. At Lavacolla airport and at the railway stations and bus stations is also possible to store luggage at the left-luggage office. In the case that travellers require medical care, resident pilgrims are usually sent to the health centre Concepción Arenal (Santiago León de Caracas, 12 | (+34) 981 527 301) or to the University Hospital of Santiago (CHUS), (Travesia de Choupana, s/n | (+34) 981 950 000). Foreign Pilgrims usually embark on the Camino with private insurance. In this case the medical centre they are normally sent to is the Hospital Policlínico La Rosaleda (Santiago León de Caracas, 1 | (+34) 981 551 200). Along with the traditional guides, it is also possible to download the free application from Santiago Tourism, which includes short voice clips providing explanations about the main places of cultural interest in the city. Search for “Turismo de Santiago de Compostela”. The app is available for both Apple and Android devices. Those pilgrims planning to spend more than one evening in the city should bear in mind that in public hostels and, depending on demand, they may only be able to spend one night. However, in private accommodation they can stay as long as they wish or require a base camp from where they can explore Galicia. They will not regret it.